Regents Physics: Welcome to Regents Physics, an introductory course in high school physics designed to prepare students for the New York State Regents Physics Examination. 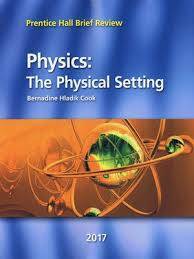 Key topics in the course include mechanics, electricity and magnetism, circuits, waves, and selected modern physics concepts. IB SL Physics: In addtion to the Regents topics covered, students will be expected to learn torque, thermodynamics, and energy production. Students will have to complete a Group 4 Project and an IB Physics Internal Assessment. Dr. Gasser teaches IB and Regents Physics in Lab 6B periods 1, 2, 3, 7, 8, and 9. Extra help is offered Wednesday's after-school. If the date needs to change, your child will be provided notice. The best way to reach me is by e-mail at BGasser@Commack.k12.ny.us. I look forward to working with you to making this a successful school year for your child!